After a very long day driving all over town -- I don't drive very well, it gets me exhausted -- I came home to find a box full of goodies! In the box, I found three new white Gelly Roll pens from Sakura -- including the newest width 05 and 10 -- and SURPRISE! 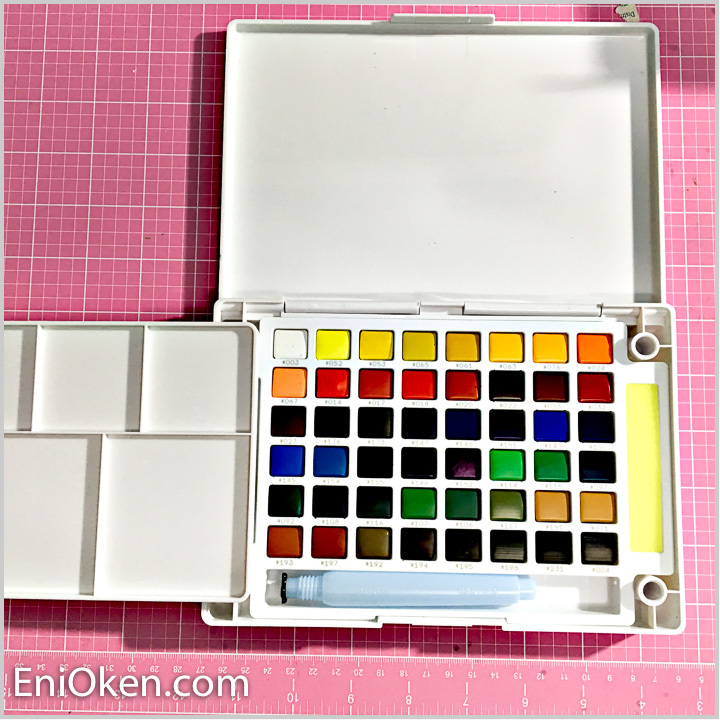 A beautiful portable Koi Watercolor set, compliments from Sakura. Now here's the clever part: the top tray can be REMOVED entirely to reveal the 48 watercolor containers. As you can see, the tray has 4 adaptors, one on each corner. The set comes with a waterbrush and a little tiny area for a sponge. Super useful. And here is the tray attached to the bottom. Combined with the lid, which stays perfectly horizontal, you have PLENTY of room to create mixes. The quality of the watercolors does not disappoint, like all the Koi watermarkers, the colors are very vibrant. They can be applied richly, almost like gouache, or thinly and watered out. If you are searching for a watercolor set, I strongly recommend this one. The colors are vibrant, easy to mix, and the set is really fun. Sakura sent me their largest set with 48 colors, and the colors are delicious! You can find it here.